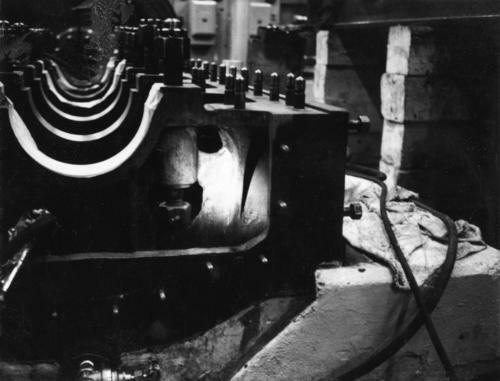 Photograph depicts the large bearing cups of one of the Ruston Hornsby diesel engines that turned the generators in the power house on the Cassiar plant. Engine believed to be under repair. Electric panels in background. Item is part of the Cassiar Asbestos Corporation Ltd. fonds. Image is one of five, see also items 2000.1.1.3.18.5 - 2000.1.1.3.18.8.